Shoulder pain is an extremely common complaint, and there are many common causes of this problem. It is important to make an accurate diagnosis of the cause of your symptoms so that appropriate treatment can be directed at the cause. 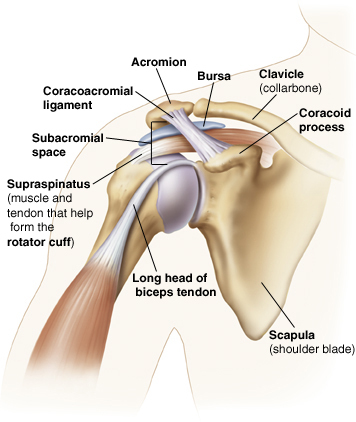 Often muscle and joint dysfunction leads to faulty movement patterns of the shoulder. This may lead to specific tissues and shoulder muscles getting “beaten up” by continually being reaggravated. Because there is pain, some people tend not to move there shoulder which can lead to a frozen shoulder. Frozen shoulder usually begins innocently enough. Your shoulder is bothering you, so you don’t use it. If you’ve injured your shoulder or are suffering from chronic shoulder pain and you don’t use your shoulder for a long time, your joint will stiffen up. From there, it becomes a vicious cycle. If your joint begins to stiffen up, it’s more difficult and more painful to use your shoulder. So you use your shoulder even less. Your shoulder gets more and more stiff, and eventually, the lining of the joint gets stiff. Once that happens, you won’t be able to move your shoulder much, even if you want to. It simply won’t budge past a certain point because of pain and stiffness. In general, frozen shoulder can come on after an injury to your shoulder. Nonetheless, any condition that causes you to refrain from moving your arm and using your shoulder joint can put you at risk for developing frozen shoulder. The shoulder slowly becomes more stiff. This is when the ligaments shorten and do not stretch, causing you to lose mobility in your shoulder. Keeping the shoulder moving, to work the stiffness out of the ligaments and tendons so adhesions can’t form, is the way to go. Because lack of use and motion is what leads to stiffness. A very effective method of treatment has been found to be A.R.T., Graston therapy, electrical stimulation, ultrasound along with heat and cryotherapy. Rather than just addressing just one area, ART® restores unimpeded motion and function to all soft tissues. Graston therapy is a soft tissue technique aimed at breaking up scar tissue and adhesions to promote the rebuilding of scar tissue in the correct line of force to strengthen the muscle, increase flexibility and movement, and promote normal function of the soft tissue. Graston therapy incorporates the use of stainless steel tools that are used to detect and treat scar tissue within muscles, ligaments, tendons and all other forms of soft tissue. By breaking up this poorly formed scar tissue and encouraging the body to form healthier and stronger scar tissue. We will also show you exercises and stretches for you to do. Kinesio tape will also be applied over and around muscles in order to assist and give support or to prevent over contraction. The tape creates a dynamic or “kinetic” moving support. This support is ideally suited for improved circulation, stabilization of injured areas and increased input to the nervous system. Set up a consultation below to discuss how I can help you with your shoulder pain. Get the treatment that you deserve at BackAndHealth. Do not forget to sign up for free health alerts on the upper right hand side.